Here we have a rather special, highly elegant, restored vintage Rolex Precision gentleman’s dress watch in 18ct gold from 1954. At 34mm diameter, this is a large sized Rolex Precision for the period. This watch also has its original unrestored golden ‘Sunburst’ dial in the classic style, with original gilt ‘Dauphine’ hands. Sunburst dial Rolex Precisions are rare. Rolex Precision, along with Rolex Oyster Perpetual, are our best selling watches and yet this is only the third Rolex precision with a Sunburst dial we have seen in the past five years. The example here is super rare, as the dial is totally original and unrestored and yet it is in almost flawless condition. Typically a dial of this age will suffer from fading, staining, pitting, scratching, spotting as well as other forms of damage, but to the naked eye, the dial here looks perfect. Only under high magnification can the faintest signs of spotting be found. We have therefore concluded this dial is in far too good condition to restore and so we have left it alone. The appearance of the dial is amazing as the colour varies subtly as the ambient light changes from a straw yellow to a deep yellow gold, through to a bronze colour. It is a perfectly balanced dial with applied gilt batons and the Rolex ‘Coronet’ at 12. The batons are matched with gilt ‘Dauphine’ hands and a gilt centre seconds hand. The dial is signed ‘Rolex’ and ‘Precision’ with ‘Swiss’ at the very bottom of the dial below the ‘6’. This is the original high grade Rolex Calibre 1215, 17 Jewels movement, which as can be seen in the photographs is in sparkling condition. The movement has been fully overhauled and serviced. This means it has been completely disassembled, cleaned, inspected and rebuilt using original Rolex parts where required, by our vintage Rolex specialist watchmaker. When tested and calibrated, this watch was running to within -2 seconds per day, which is outstanding for any vintage watch of this age. This is also among four or five of the most accurate watches we have tested this year. When fully wound, this movement has a 58-hour power reserve. The movement is all correctly signed ‘MONTRES ROLEX SA’, ‘GENEVA SWISS’, and ‘17 Jewels’, with the Calibre number 1215 and the reference number 466. These movements are strong, accurate and very reliable, making the watch perfectly appropriate for regular everyday use. This particular movement is in top condition and with regular servicing every 3 years, we would fully expect this watch to run very happily for many more decades to come! We are therefore more than pleased to offer a 12 month warranty on this watch movement* and regular servicing in the future. The original Rolex Swiss made 18ct yellow gold watch case is of very high quality with the sought after Rolex ‘Coronet’ on the outside of the case back. 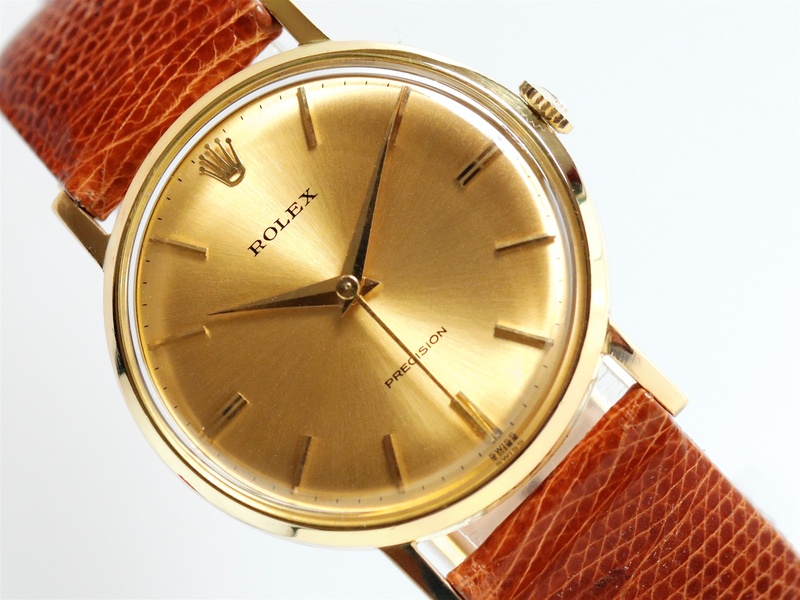 18ct Rolex Precision cases are rare, as by far the majority in the UK were made in 9ct gold. Just occasionally, Rolex Swiss made 18ct cases which also have the Rolex Coronet which elevates the watch into the very top, of top-class examples. 18ct gold is also slightly more golden than 9ct gold and this compliments the sunburst dial beautifully. The case is of two-piece construction with a press fit case-back which fits and clicks back with a firm and reassuring click. The case measures 34mm in diameter, excluding the original signed Rolex crown, so this is a large sized gent’s Rolex Precision by the standards of the day. The outside of the case-back is highly polished and has never been engraved. Inside the case-back, all the markings are correct and as expected with ‘Montres Rolex SA, Geneva Switzerland’ along with the model reference number 9708. The case-back also carries Geneva, Swiss 18ct hallmarks. As stated above, the outside of the case back also carries the Rolex ‘Coronet’, which can be seen in one of the photographs, along with the case serial number 972564 . These markings indicate the watch was manufactured in 1954. A new high quality, Tan ‘Lizard’ strap has been fitted, along with a gold plated Rolex buckle. We feel the strap matches the watch nicely, however, if a different colour or style of strap is preferred, please let us know and we will do our best to oblige free of charge. We carry tan, conker, dark brown and black in stock in plain padded leather, crocodile skin or lizard skin, however, we can also obtain most types and colours at short notice. Although there are no original papers with this watch, all the numbers and markings on the watch are correct, dating the watch to 1954. A detailed ‘Particulars’ document will be included in the sale, along with our detailed receipt and 12 months warranty*. A separate insurance valuation for the replacement value of this watch will also be provided at the time of sale, along with our unique ‘Lifetime Authenticity Guarantee’ which states: “If at any time, this watch proves to be anything less than totally authentic, or not as described, Vintage Gold Watches of London will offer you a full refund at any time”. The inner and outer Rolex presentation boxes shown in the photographs will be included with this watch. This is a rare and first class example of a highly collectable and highly practical vintage watch from horology’s most famous name, which will provide an excellent financial investment as well as something to use, wear, treasure and enjoy! It will make an excellent evening wear dress watch as well as a practical highly accurate and reliable timepiece to use on an everyday basis. Vintage gold Rolex Precision watches are highly collected and the rarity of this watch means the value will always remain strong. This watch will make an excellent investment and family heirloom piece and even though vintage Rolex prices have risen markedly recently, we feel fine examples such as this still remain undervalued. As each year goes by and the world market for vintage watches expands, availability will become more limited so prices are surely destined to climb ever higher!